The Oriented Natural Reserve of the Salinas of Trapani and Paceco holds the land included between Trapani and Paceco towns and, more exactly, the area extending from the southern zone of the chief town to the hamlet of Salina Grande. Here the salt processing equipment, created centuries ago, have harmoniously merged with the natural landscape to give life to an unique and deeply suggestive habitat. Perhaps it is one of not many examples in our civilized world of how the human productive activities not only have not destroyed the original habitat, but also, on the contrary, have made it precious by a very special touch. You can fully understand its beauty especially at sunset: when the sun sets, each of the tanks assumes a different shade, from intense pink to red and to golden. Observing them, in those few moments before all ends, you will see, as for magic, colours and shades chasing each other. 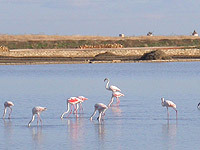 The reserve was instituted in 1995 to protect one of the last damp areas still present in western Sicily. From then, its 986 hectares, divided in reserve and pre-reserve, are placed in Wwf Italia care. For more information, visit the site www.salineditrapani.it . Since time immemorial, all this area has been devoting itself to the extraction of salt from the sea. As it is easy to realize, so we are talking about a land marked by a very high concentration of sodium chloride, that surely is not the ideal condition to the flourishing of a wide vegetation. Yet it is extraordinary how some species can also adjust themselves to such irksome soils, developing, in time, apposite survival mechanisms. This way acted the Salt-wart, the grey-silvered coloured Halimione portulacoides, the Suaeda, the Atriplex alimus, the Frankenia pulverulenta, the Limonium avei and the Bupleuro, that you may find along all the rim of the tanks for the picking of salt. Along the paths, you may also find the Fungo di Malta (Mushroom of Malta), plant without chlorophyll that lives only in not many other resorts of Mediterranean Sea. The coast-line area between the Salinas Ronciglio and the Baiata gat is dominated by species typical of such habitats: Mattiola, Gramigna delle spiagge, Inula crithmoides and the Limonium serotinum. Also some rare endemic species, such as the Calendula maritima, the Limoniastrum monopetalum and the Limonium densiflorum. The birds – Being one of the very last damp areas on the course of the peregrine birds that moves from and to Africa, the Salinas of Trapani and Paceco represent for many of them an important stop and refreshment point. The rare Tarabuso, protected for international standard, the white Garzette, the Pignattaio with its hook-bill, the Sgarza ciuffetto, the Spatola easily recognizable for its strange bill, the Moretta tabaccata and the Falco Pellegrino here find food and refuge. Often, as they pose for a photo, Herons and Flamingos keep still for a long time on the thin daws with the head bended downwards, looking for food on the bottom of the tanks. Neither the specimens of palustrine fauna, such as the Hawk and the Marsh Owl are absent. The swoops of the Kingfisher and the fisher Hawk are spectacular when they sight their preys from above and throw themselves on them. Some species like so much this place that decide to stop here to nest. We are talking about the Stilt-bird, of the Kentish-flower and of the Puffin, of the Avocet and of the Volpaca. The rare Teia Dubia, little butterfly present only in the Salinas of Trapani and Paceco and in the Stagnone of Marsala, find refuge and food on the bushes of Salt-wart. The moving and the distribution of this species elsewhere is practically impossible, since the female is unwinged. The Mammals – But do not think that these Salinas are comfortable only for the birds. In fact, also Foxes, Weasels, Hedgehogs and Rabbits lives here. The Fishes – The Nono (Aphanius fasciatus), a little fish the European Community has declared in danger, swim in the canals and in some tanks.